A new game which was recently revived by the game’s author, after seeing on a disk for some 26 years. 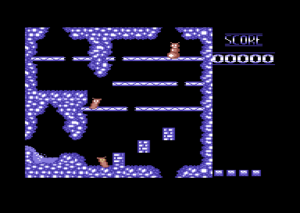 Fire Breath was a game inspired by Bubble Bobble and Creatures, created in 1990 by Erik Hooijmeijer. The game was send off for publication to a publisher, but the disk was returned without any comments. The author assumed that the game was therefore not good enough for release. A shame, as although the game has its faults – it should have been released in some shape or form – it’s a decent game.